Sonoma and Napa counties abound with olive trees, and in the town of Sonoma, where I live, they are everywhere: in parks and private gardens; surrounding commercial vineyards; even scattered throughout the town's ancient cemetery. I’m a certified, life-long olive aficionado who has rarely met an olive she didn’t adore (and devour). So when I moved here a few years ago I decided to attempt curing my own olives. As it turns out, the process is easy—and, despite what you may have heard, you don’t have to use lye or any other nasty products. I make two different sorts of olives: water-cured green olives and salt-cured black olives. Young olives are green, but as they mature on the tree they turn black. Right now, in mid-October, hanging olives have attained full growth but are still green. Locate a large glass jar with a lid, sterilizing both in boiling water. A large-size mayonnaise jar is about the smallest you’ll want to use (I use a jar that’s about half again as big as a large mayo jar). If you're having trouble finding a good-sized jar, try a thrift shop: they abound in glass jars. Go pick your green olives. Choose unbruised, fleshy olives. You’ll want enough olives to almost fill the jar, leaving at least 1” of empty space at the top. Place the olives in a cold water bath. Then remove them one by one, placing a small but deep cut in the flesh with a paring knife. Try to hit the olive’s pit. Then place the olive in the jar. 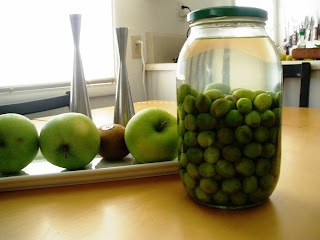 When all olives are in the jar—and remember to leave at least 1” of space at the top—fill the jar with cold water. Put the cap on and tighten it. Then place the jar in a coolish location (but somewhere you'll be sure to see it each day). Once a day for the next 3 weeks, empty the jar’s water and replace it with fresh cold water. 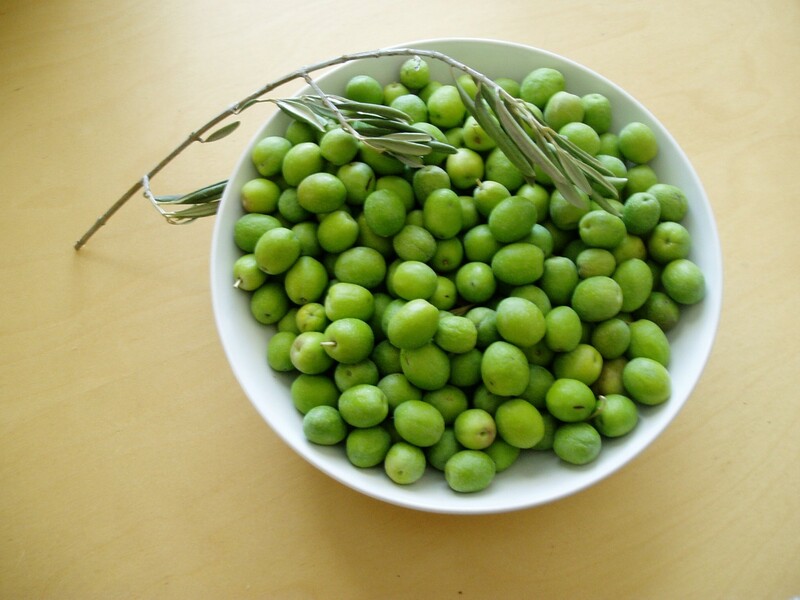 The consecutive cold water soaks remove the bitterness of the raw olive, something done quickly in olive processing factories with lye. If you go away for a night or two and can’t change the water, that’s okay. If it’s longer than that, though, give the jar to a neighbor and ask them to replace the water each day. 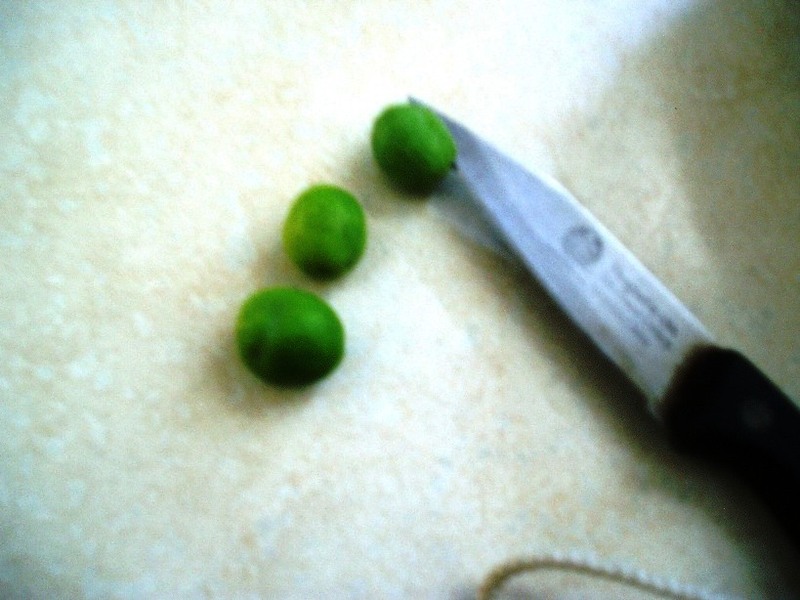 By the way, the beautiful chartreuse color of the fresh-picked olives will begin to fade about Day 3. Don't be alarmed; that's just part of the process. After about three weeks, nibble on one of the olives. If it’s still bitter, continue the daily change of water. If it has only a bit of bitter tang, that’s when I move to the next step; I like an olive with a little bite. But you may prefer an olive with no bitter tang at all, and that's fine. The bottom line: when the olive reaches a state that pleases you, it’s time to move on to the next phase of olive curing. I’ll discuss that phase next week in Part 2. Also, in November I’ll show you how to salt-cure black olives. These black olives are yummy additions all winter long to spaghetti sauces and hearty stews. I LOVE this! I'm going to give the recipe to my husband, a chemist by training, and let him have some gourmet fun!